There are no brownie points for knowing that hair is important. Hair is one of the many things that play a crucial role in making you look younger than your actual age. Changing your hair can change your whole look. Here we have gathered all the relevant facts that can revolutionize your look and make you as pretty as you’re meant to be. The boring look cannot be totally transformed into something world-shattering without learning these Simple Hairstyling Tricks to look 10 Years Younger. Most of the time it’s the fault of hairstyle to make people look old. Not every hairstyle works on every face. It is important to determine your face type and choose the cut according to it. Why not try some bold haircuts like feather cut, pixie cut, long bobs, short bobs, flirty pixie, etc., etc. There are hundreds of options out there. Always avoid the haircuts that make you look dull and grandma. Just select them wisely, and you’re ready to go. There is nothing wrongs with doing a little experiment. Changing your hair color is one the Simple Hairstyling Tricks to look 10 Years Younger than your age. Try light and bright colors on your hair to make it feel more rejuvenating. Either get your full head done or you can always try doing highlights only. Both work perfectly fine. Just consult a stylist and do some research beforehand to avoid the blunder. Thin hair makes a face look dull. It makes you look ten times older than your age, and if you have thin hair, then definitely try this. To achieve more volume, get a layered haircut. These layers create an illusion of having more strands on the head. Also, try curls to make your head look full of luscious locks. But too much of it will make you look old and unnatural. This one is must in our Simple Hairstyling Tricks to look 10 Years Younger guide. If you’re going to ask me, I find the long hair very beautiful but it gives me old lady vibes, and when you can be experimenting and adventurous, why not chop it get something good out of it. Short length cuts tend to look more crazy and active. Don’t keep your hair too long or too short. Always maintain it from mid-neck to chin level. Try short or long bob; baby cuts to appear more youthful. Most of us have long foreheads which with age get full of wrinkles. These lines make us look more wise and elder even before we do. These fringes can make your eyes pop out more and bring shine to the face. Just make sure not to carry short edges, or it will make your face look chubby which is not right. Keep your fringes thick, try to have a razored cut look, and choose an option that works well with your face shape and size. There are many ways to part your hair, and your look depends a lot on it, secretively. Most of the professors and officers have the middle parting, and it gives them a strict appearance. Try the experiment with the partings. Either go for zigzags, side partings or sometimes no parting at all. Tying your hair tight and in same style every day makes your hair be in that way always. It makes them rough and harsh which you should avoid every-day. Change the way you keep your every day and keep it healthy. It is the main point of our Simple Hairstyling Tricks to look 10 Years Younger guide. 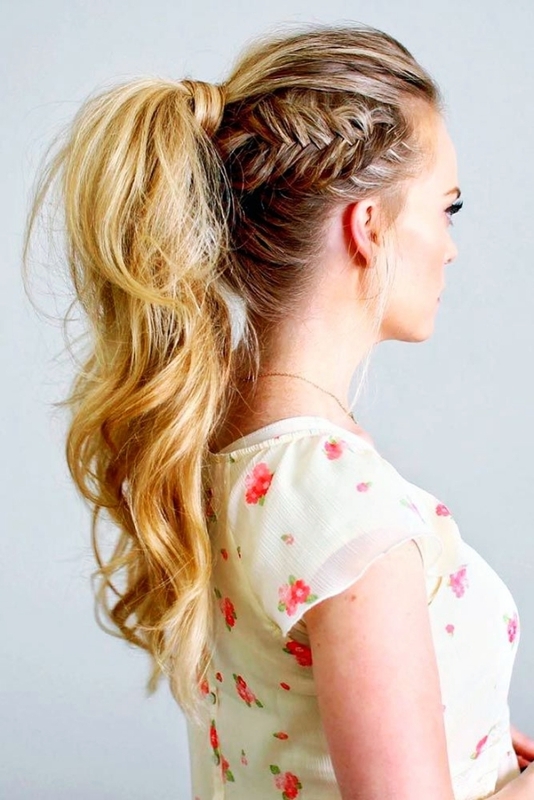 Evening hairstyles should always be fun and playful. Do not try to keep it under control or it will ruin your whole appearance, and nobody wants that. Keep it light and loose and ruffled. No matter you try or do to your hair, always take good care of it. With age and environment, the hair tends to lose its charm. Maintain your diet, give you hair some massage and keep it away from harmful hair products. Hair products are dangerous. No matter of which brand they are, they can damage your hair. Even if you try them, try best brands and according to your hair type. Keep good care of your hair always. Your dress and hairstyle should be balanced. Always making a bun or pony tail will not match with every kind of dress. Surf the net and find out right hairstyle with different outfits you’re carrying. With all the hair and dress, balance your makeup too. It should not be overdone, or your hair would not be able to keep balance. Keep your makeup according to event, time and dress. You can use one tip at a time or you can combine multiple tips at one go. You know your hair better than anyone else, so make sure you give it that space too. So these were some Simple Hairstyling Tricks to look 10 Years Younger. Which one are you trying today?